It was a little after 7 am, and the day was calling. We’d barely rolled out of our v-berth, and we were already breaking a sweat. The Red Thread was heating up rapidly. It was sure to be another scorcher. An exciting day was ahead. We’d been back from our two-week backpacking trip to Antigua (for Semana Santa), Copán, and Utila for less than 48 hours, but we already were readying ourselves to move again – this time, by sea once more. 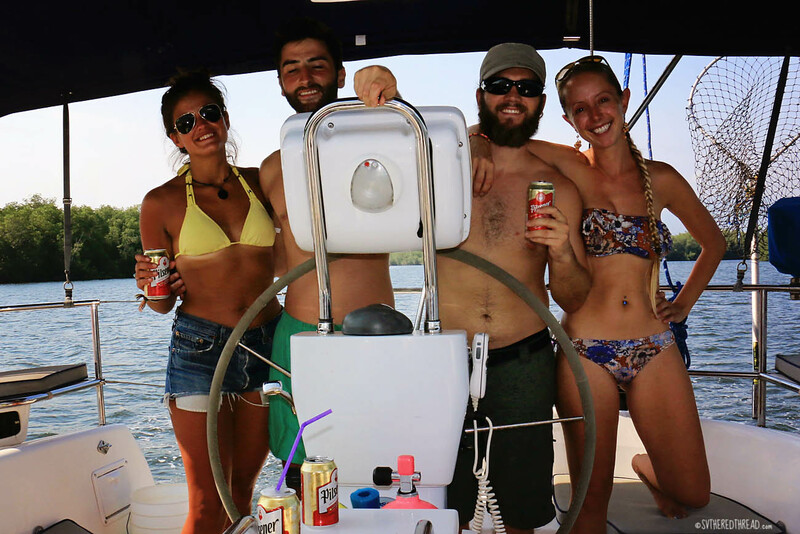 In a fantastic twist of luck, the British backpacker we’d befriended in Honduras, Tim, had decided to rendezvous with us and sail from El Salvador to Nicaragua. 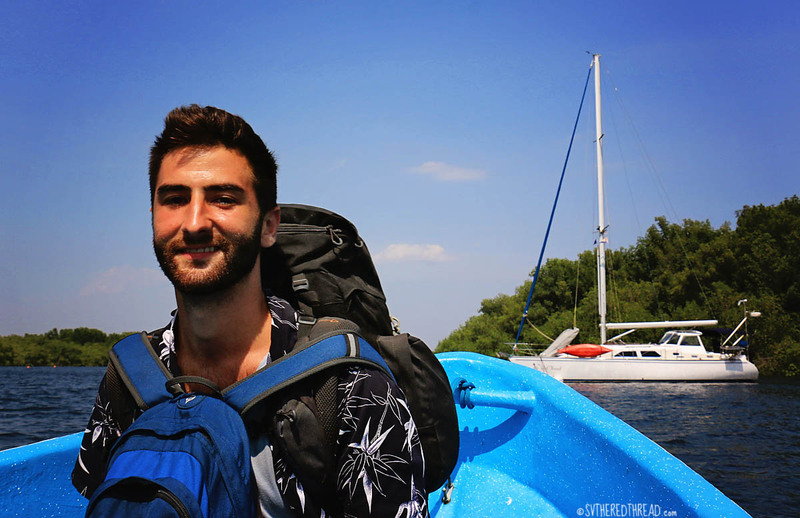 He asked if we’d mind if his friend, Emma, whom he’d met while on the Central American travel circuit, joined. The more the merrier! If Tim liked her, surely we would, too. We’d agreed to meet in Usulután and, once again, Emerita at Puerto Barillas generously adjusted the weekly trip to town to meet our needs. While Neil stayed and tended to the task of obtaining our zarpe, I would go and track down our friends. Our guide, whose name escapes me now, was nice. Really nice. He marched us along the path and bushwhacked a short path to the edge of the swamp that ran parallel to the trail, where the beady eyes of prehistoric reptiles peered at us, their scaly bodies hidden beneath the murky water. Strange-looking birds called boat-billed herons, flitted from limb-to-limb along tangled, low-hanging branches, while their chicks teetered in twig nests built tenuously above perilous waters. 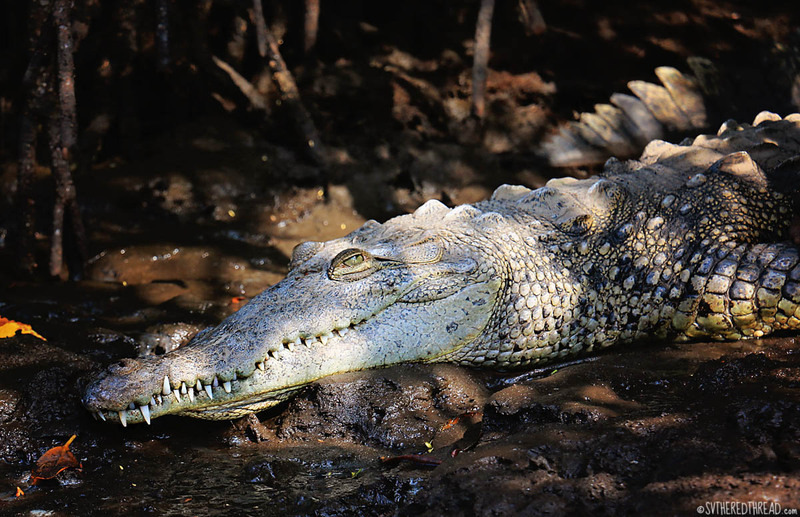 A fluffy chick would not make for much of a meal but would certainly suffice as an hors d’ oeuvre for a crocodile! We walked on, past a lake and into a banana plantation. There, we found a clearing and a handsome old man. His smile was missing a few teeth and the corners of his eyes were fixed with creases that gave away his sense of humor, even before his jovial personality was revealed to us. Our guide voiced our hope that we might see the monkeys. The old man grinned and turned his back to us. The old man walked away from us, his eyes fixed high in the trees. “Paaaaaaaaaancho…” he called, “Pancho!” His appeals continued and soon after, a troop of monkeys emerged swinging from the canopy. One…two…six…ten? A family of spider monkeys descended around us. As it turns out, Pancho is their patriarch, and the pet of the keeper of the banana plantation. The smiling old man, aware of our amusement at his comradery with the spider monkeys, handed us banana after banana and then a mango. We fed the monkeys from our hands and giggled at their silly behavior. They crawled and competed and squeaked and swung. One monkey had been injured and was now being picked on by the others. The old man had given her refuge in a large cage while she recovered. She shook our hands, her eerily human fingers, gripping ours. She cared little for food we had to offer, but she pressed herself against the gaps in the wire cage, beckoning us to scratch her back. After we’d had our fill of monkey business, we began the walk back to the Puerto Barillas compound. 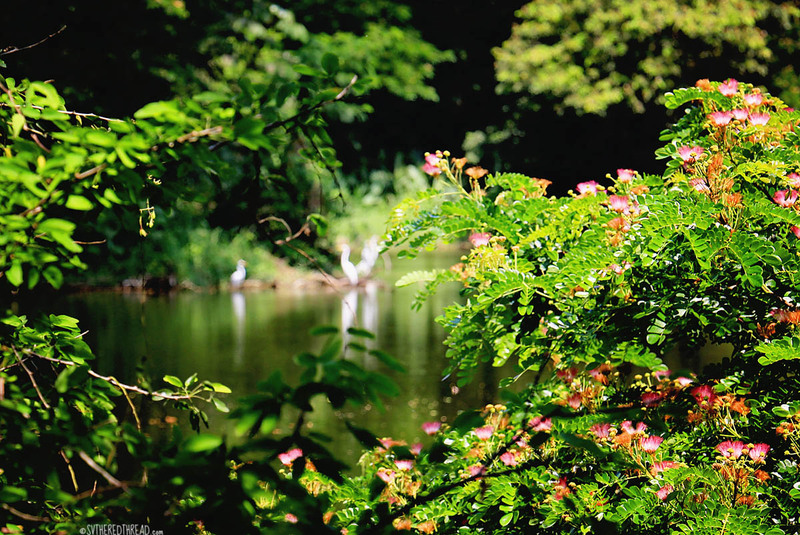 The day was growing hotter, and the jungle would soon grow quiet to rest during the heat of the day. We thanked our guide over and over again. We’d seen howler monkeys in the trees in Costa Rica, but we hadn’t interacted with them and this was our first time seeing spider monkeys. Our morning could not have been better! An hour later, I was sitting in a grocery store on the lookout for a couple of grubby gringos. Chicken buses, however, crude they may seem, are remarkably efficient! Tim and Emma had caught three buses from El Cuco that morning, traveling halfway across the small nation of El Salvador. They arrived at almost exactly the time they’d projected. Introductions and hugs were shared. I’m not sure who was more excited—our new sailing mates or me! We spent a few minutes at the market provisioning for the overnight passage ahead and babbled happily during our jaunt back to Puerto Barillas. A couple exit stamps on our passports from Puerto Barillas’ Migración Officer, and just like that, we were officially a crew of four. 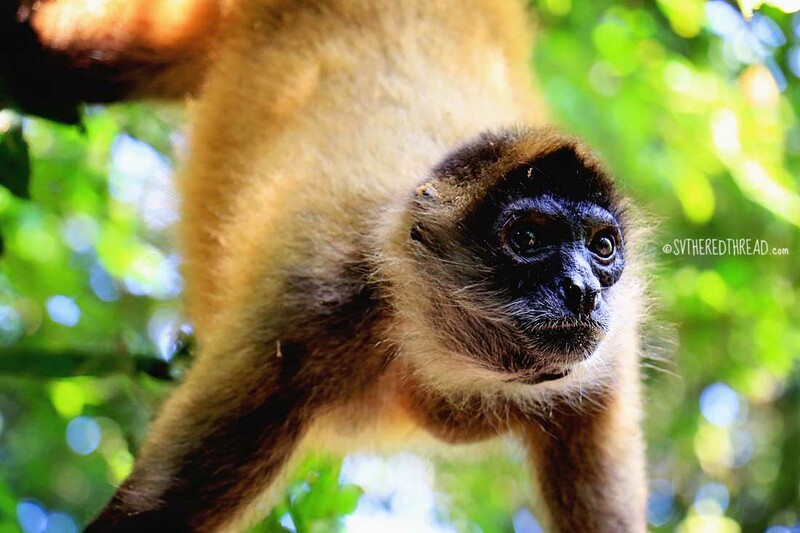 This entry was posted in By Jessie, Central America, El Salvador, Friends and loved ones, Inland Adventures, Wildlife and tagged Puerto Barillas, Spider monkeys. Bookmark the permalink. OK – I have to ask if you were nervous around the croc’s? They look really scary! Love the pictures and can’t wait for the next installation! Oh my gosh, Jessie! Those monkeys are adorable and what a wonderful experience to meet them like that. I hope the little wounded one recovered and didn’t get picked on much more!